Oh no! Mario had an accident, but he still needs to save the Princess and Kingdom! Help Mario save the day in this fun ROM hack - Super Wheelchair Mario! Super Wheelchair Mario is a fun hack of Super Mario Bros. 1 for the Nintendo Entertainment System (NES). In this game, Mario will be doing the usual saving of the kidnapped princess and the kingdom while in the wheelchair. The levels have been edited to cope up to a little, but the game is notable more challenging than the original game due to Mario's inability to jump and defeat the monsters by stomping. Super Wheelchair Mario is an online NES game that you can play at Emulator Online. This free Nintendo game is the United States of America region version for the USA. Super Wheelchair Mario is a single title from the many platform games, arcade games and mario games offered for this console. If you enjoyed playing this, then you can find similar games in the nes games category. 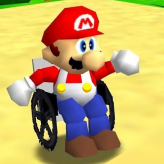 Super Wheelchair Mario game is from the various retro games on the site, and there are more games like this, including Super Mario 64, Super Mario World and Super Smash Bros..